The only laundry system you'll ever need? There’s going to be a lot of cool new tech shown off at CES this week, but some products are definitely more functional than exciting, such as the numerous washing machines at the event. Samsung, however, believes its four-in-one laundry system is "the most advanced, flexible laundry solution" ever made, and it could be right. The FlexWash + FlexDry machine combines two washers and two dryers into a single system, each one designed for different situations. 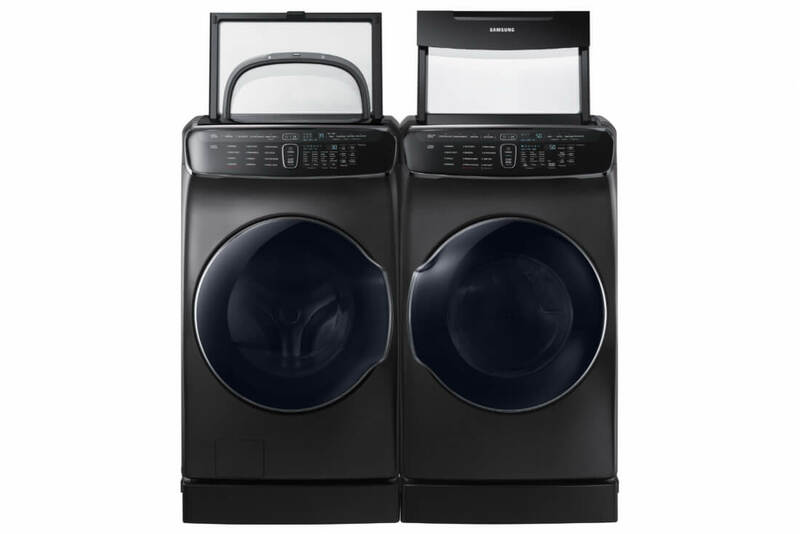 The main FlexWash front-loading washing machine offers five cubic feet of laundry capacity, which Samsung says is the largest in its class, able to handle both normal and bulky loads. But the best part of the FlexWash is the second, one-cubic-foot washer on top. Both sections operate independently of each other, and you can wash normal loads and delicate items at the same time. Unlike LG’s dual-load Twin Wash system, the washing units in Samsung’s machine are integrated into the same body and don’t need two separate water lines. FlexWash’s internal separator sends the front-load water one direction and the top-load water in another direction. Once you’ve put your laundry through a wash, simply stick it in the FlexDry section. Like the FlexWash unit, there are two parts to the dryer: the main compartment for heavy loads, and the Delicate Rack zone for delicates at the top, which adjusts the heat depending on what type of fabric is being dried. Like most of today’s products, the entire system is IoT-enabled, meaning users can control everything from their smartphone using the Samsung Smart Home app. Hopefully, it doesn't also mean hackers can mess with your laundry cycles. Samsung will no doubt be hoping that the FlexWash + FlexDry helps erase consumers’ memory of the 2.8 million washing machines it recalled last year, following reports that they were shaking themselves to pieces. No word yet on how much the FlexWash + FlexDry will cost or when they’ll start to ship, but Samsung may reveal more at the CES.